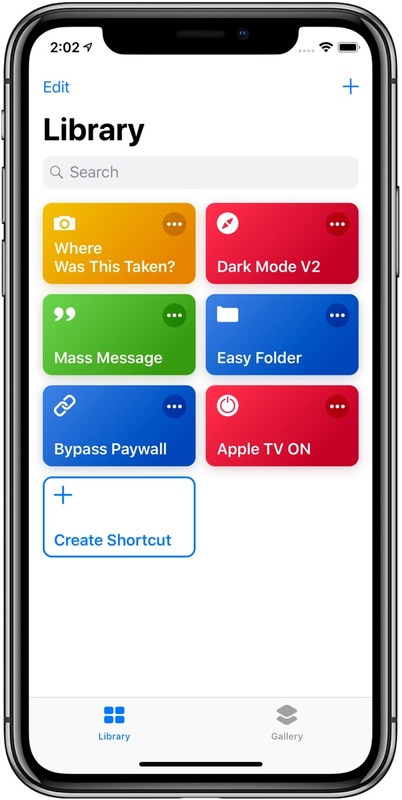 If you use Apple’s Shortcuts app for iOS automation and would like to turn on or wake up your Apple TV and its connected TV set on demand, we have just the right shortcut for you. Welcome to iDB’s column dedicated to iOS automation scripts for Apple’s Shortcuts app. We try to find inspiring community shortcuts, created by users from all around the world, that will save your time and boost your productivity. 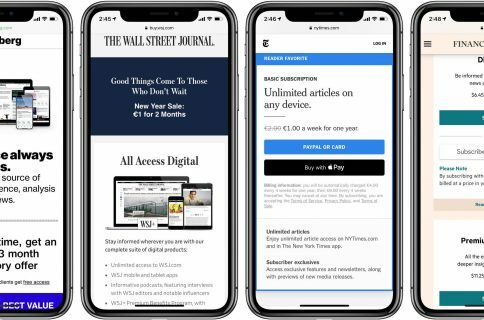 Some of the scripts we’ve covered let you bypass article paywalls, get Dark Mode on any website in Safari, text multiple recipients in separate messages, add Apple Music albums to the Home screen and more. Be sure to check out iDownloadBlog’s Shortcuts Focus archive. 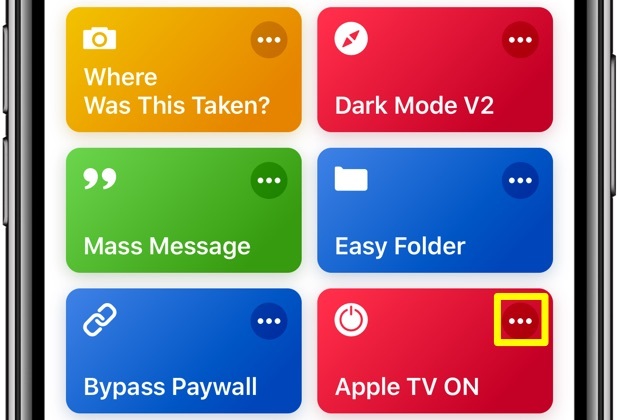 This shortcut, titled Apple TV ON, was created by Reddit user “ROPit”. As mentioned, it lets you turn on or wake your Apple TV from sleep. If your connected TV set supports the HDMI-CEC protocol, your Apple TV will also automatically turn on your television. 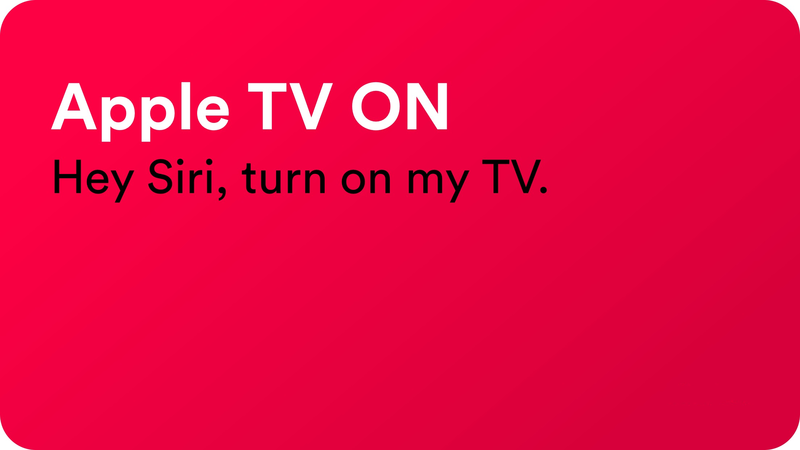 As the Redditor explains, you can add a personalized voice trigger phrase such as “Hey Siri, start up my Apple TV” if you’d like to turn on your set-top box with a simple voice command. You can freely integrate this shortcut as part your own complex iOS automation workflows. 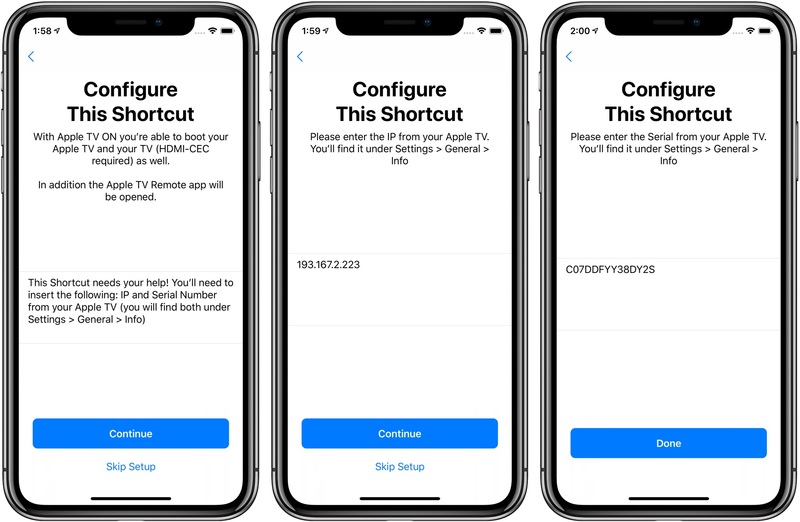 After turning on both your Apple TV and television set, this shortcut will also launch Apple’s Remote app (if installed) so you can immediately start navigating the tvOS user interface or have the ability to turn the device off with a tap. First, you need to download Apple’s free Shortcuts app if you haven’t already. 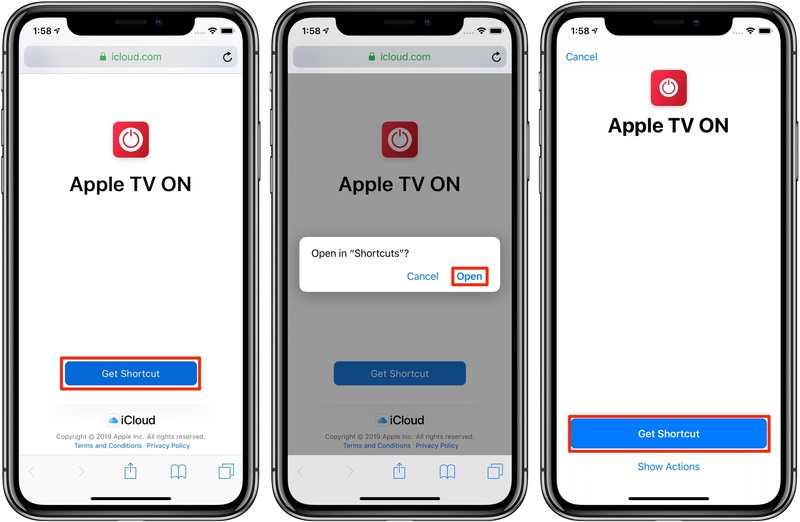 After you’ve set up Shortcuts, visit the iCloud download page for Apple TV ON in Safari on your iPhone or iPad with iOS 12.1.1 or newer, then tap the blue button labeled Get Shortcut. 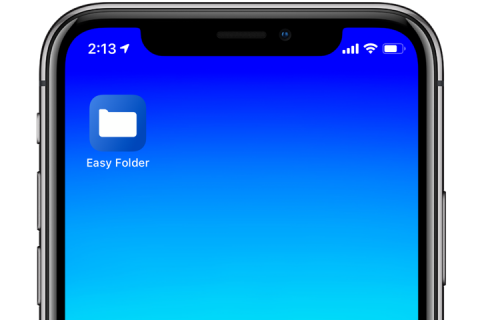 If asked whether to open the file using the Shortcuts app, tap Open. 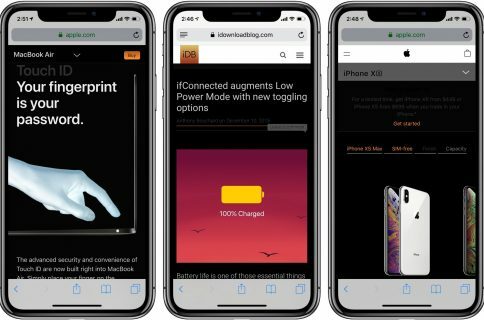 Safari will download and open the script in Shortcuts. The Shortcuts app will pull up the import screen for you to confirm you’d like to open this file by tapping the button Get Shortcut. You’ll be greeted with the Configure This Shortcut screen. Tap Continue to proceed. When prompted, enter your Apple TV’s IP address and the serial number, both of which can be found by venturing to Settings → General → About on your Apple TV. The imported script can be found along with others under the Library tab in the Shortcuts app. To access options, hit Library and tap the three dots in the shortcut’s upper-right corner. Now tap Siri Phrase to create a custom spoken command to trigger this shortcut. On the Add to Siri screen, tap the red circular button at the bottom to start recording your custom phrase, then hit Done to save it. In case Siri misheard you or you would like to record a different phrase, tap the blue link Re-Record Phrase. 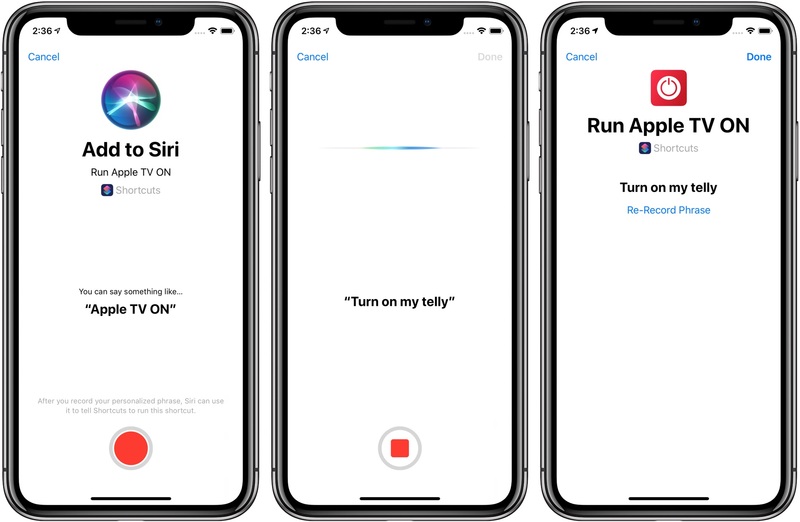 After recording your personalized trigger phrase, Siri can use it to tell the Shortcuts app to run this shortcut. Lastly, decide whether the shortcut should open the Apple TV Remote app. 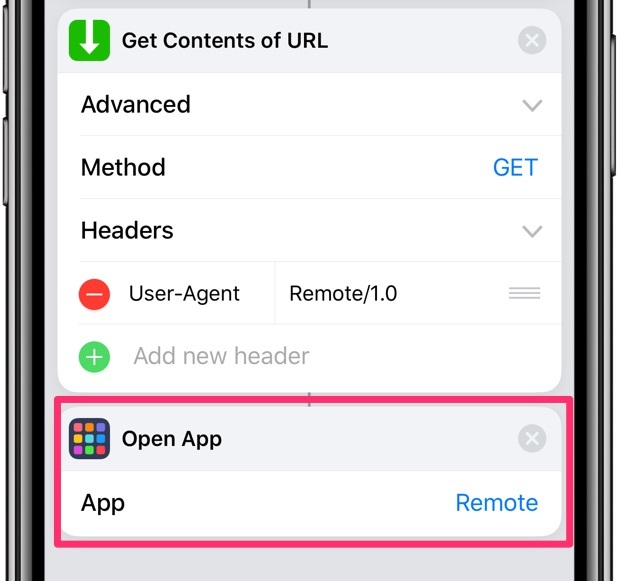 If you’re planning on incorporating this shortcut into more complex iOS automation workflows, you probably don’t need the Apple TV Remote app to pop up automatically, in which case you can simply delete the last action, labeled Open App. Lastly, the settings screen lets you adjust other features of this shortcut to your liking: tap Name to give the shortcut a custom, more descriptive name, hit Icon to assign it a custom icon, choose whether the shortcut appears in the Shortcuts widget and iOS’s multi-purpose Share sheet, add the shortcut to your Home screen as an icon, and much more. And that’s it, girls and boys! Here’s our hands-on walkthrough of iOS 12’s Shortcuts app. If you find this series useful, be sure to share your favorite shortcuts in the comments.